The Presser Foundation is pleased to sponsor the February 17, 2019 Philadelphia Youth Orchestra (PYO) Concert being held in Verizon Hall at The Kimmel Center for Performing Arts. 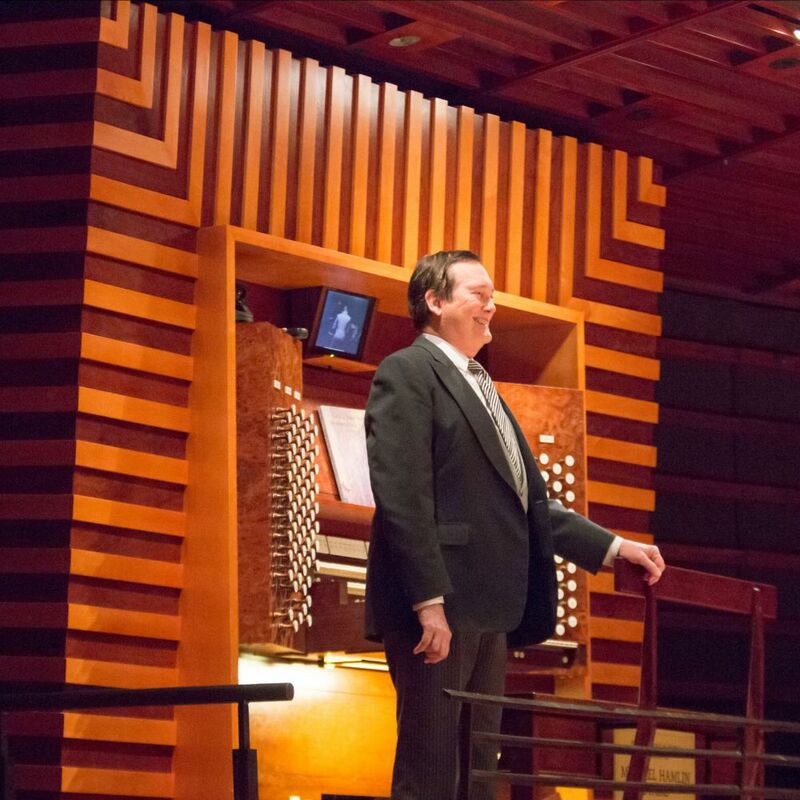 Beginning at 3 p.m., the concert celebrates the legacy of Michael Stairs, the renowned organist who has performed worldwide and made such a major impact in the Philadelphia area. Michael Stairs offered his musical contributions to PYO and last performed the Strauss and Saint-Saens selections in 2014 at the PYO 75th Anniversary concert being repeated at this PYO concert. The February 2019 concert features the extraordinary talent of two special guests - David Kim, Concertmaster of the Philadelphia Orchestra, and Peter Richard Conte, renowned organist. It will showcase the 130 members of the ensemble, between the ages of 14 to 21 who are conducted by the esteemed Maestro Louis Scaglione. Maestro Scaglione looks forward to recognizing Stairs at the concert with such notable special guests and he is honored by the recognition of The Presser Foundation. He said, "Michael Stairs was a great friend to me, personally, to the PYO organization, and musical treasure of Philadelphia. We are most grateful to The Presser Foundation for making this celebration of his musical legacy possible. The positive recognition from The Presser Foundation is a demonstration of the support our talented students and worthwhile programs continually receive. We are humbled by their generosity and offer our deepest gratitude. We are, also, delighted to welcome back the distinguished friends and colleagues, David Kim and Peter Richard Conte, as our special guests during this performance." Tickets for the PYO Concert are $20 to $30 and can be purchased through Ticket Philadelphia by calling 215.893.1999. About Michael Stairs - Michael Stairs was a musical treasure in the Philadelphia region and beyond. The renowned organist, choir director and music theory teacher, in 1985 he was honored that Maestro Riccardo Muti appointed him the organist for The Philadelphia Orchestra which led to his solo performances in Carnegie Hall and Suntory Hall in Tokyo. Stairs served many churches in the area -- Church of St. Asaph in Bala Cynwyd for 13 years and the Church of the Redeemer in Bryn Mawr for 25 years. He is Organist Emeritus at The Redeemer, and retired from over 25 years of service at The Haverford School, where he taught four levels of music theory, directed the 50 voice Glee Club, and started his select vocal ensemble, The Notables, who completed a successful concert tour of Copenhagen and Stockholm in June 2010. About Peter Richard Conte - Peter Richard Conte is an organist whose nearly-unparalleled technical facility, brilliant ear for tonal color, and innovative programming style have made him one of the most sought after "orchestral" organists of this era. In 1989, he was appointed Wanamaker Grand Court Organist at what is now the Macy's Department Store in downtown Philadelphia -- the fourth person to hold that title since the organ first played in 1911. He performs concerts twice daily, six days each week, on the largest fully-functioning musical instrument in the world. Mr. Conte is also Principal Organist of Longwood Gardens in Kennett Square, PA, and, since 1991, Choirmaster and Organist of Saint Clement's Church, Philadelphia, where he directs a professional choir in an extensive music program catering to the Anglo-Catholic tradition. Mr. Conte is highly regarded as a skillful performer and arranger of organ transcriptions. He has been featured several times on National Public Radio and on ABC television's "Good Morning America" and "World News Tonight." For eleven seasons, his monthly radio show: "The Wanamaker Organ Hour", aired on Temple University Radio (WRTI); each Wednesday evening at 7 PM, his Grand Court concert is streamed live on YesterdayUSA.com. Mr. Conte performs extensively throughout the United States and Canada under the management of Phillip Truckenbrod Concert Artists, and has appeared as a featured artist at American Guild of Organists' National and Regional Conventions. He performs with the Philadelphia Orchestra and the Philly Pops, and has appeared with numerous orchestras around the country. Peter Richard Conte has served as an Adjunct Assistant Professor of Organ at Rider University's Westminster Choir College, Princeton, NJ, where he taught Organ Improvisation. He is the 2008 recipient of the Distinguished Alumni Award from the Indiana University School of Music, Bloomington. In 2013, the Philadelphia Music Alliance honored him with a bronze plaque on the Avenue of the Arts' Walk of Fame. His numerous recordings appear on the GOTHIC, JAV, ProOrgano, DORIAN and DTR labels. About David Kim - Violinist David Kim was named Concertmaster of The Philadelphia Orchestra in 1999. Born in Carbondale, Illinois in 1963, he started playing the violin at the age of three, began studies with the famed pedagogue Dorothy DeLay at the age of eight, and later received his bachelor's and master's degrees from The Juilliard School. Highlights of Mr. Kim's 2018-19 season include serving on the faculty of the New York String Orchestra Seminar; appearing as soloist with The Philadelphia Orchestra; teaching/performance residencies and masterclasses at The Cleveland Institute of Music, The University of Texas at Austin, Rice University, Manhattan School of Music, Bob Jones University, Rowan University, West Chester University, the Taipei (Taiwan) Academy and Festival, and continued appearances as concertmaster of the All-Star Orchestra on PBS stations across the USA and online at the Kahn Academy; a solo performance on a soon-to-be-released CD with the Westminster Choir; as well as recitals, speaking engagements, and appearances with orchestras across the United States. Mr. Kim frequently appears as a guest with famed modern hymn writers Keith and Kristyn Getty at venues such as the Grand Ole Opry House in Nashville, The Kennedy Center for the Performing Arts, and Carnegie Hall. A new Getty Music CD includes Mr. Kim featured in a solo role. In September, he returns to Nashville to perform at the Getty Music Worship Conference - Sing! 2018. He is the founder and Artistic Director of the annual David Kim Orchestral Institute of Cairn University in Philadelphia, where he is also a Professor of Violin Studies. Additionally, Mr. Kim serves as Distinguished Artist at the Robert McDuffie Center for Strings at Mercer University in Macon, GA. The renowned Philadelphia Youth Orchestra organization, now in its 79th season, is one of the nation's oldest and most respected community music education and youth orchestra performance programs. Training tomorrow's leaders, PYO provides talented young musicians from across the tri-state area with exceptional musical training. Students go on to excel in many diverse fields, and it is with pride that Philadelphia Youth Orchestra notes that many members of the prestigious Philadelphia Orchestra are alumni. For more information, please visit www.pyos.org.